Real Estast, as the name has implied, is a theme for a Real Estate company. This can also be used for any business, and corporate website. With the property business turning digital, many times, customers will look at your websites before deciding to call you to arrange a visiting. Also as a real estate business, you really need a formal looking website. So our purpose is to create a professional website with clean minimal design to showcase your business, to display your apartments, residential, villas,… onsite. Every necessary function of a property site is well integrated. Delve into the description below to find out more. Browser compatibility. (IE 9+, Chrome, Firefox, Safari). Professional & clean minimal design. Step by step installation guide. 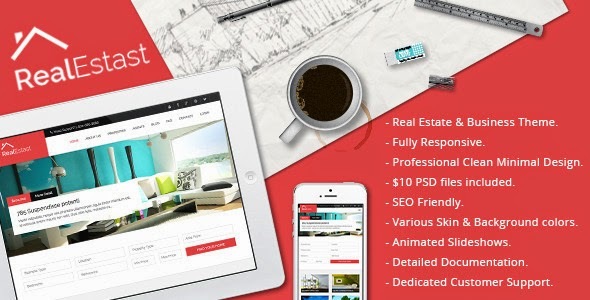 Item Reviewed: Awesome Real Estate Business Drupal Theme 9 out of 10 based on 10 ratings. 9 user reviews.